EXCLUSIVELY at the PRINCESS TWIN! 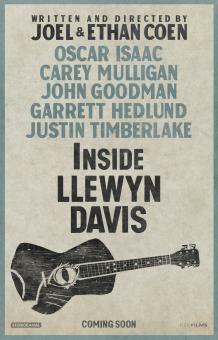 Idealistic young folk singer Llewyn Davis (Oscar Isaac) struggles to make a name for himself in the Greenwich Village folk scene of the early 1960s in this fictional period drama from Joel and Ethan Coen. As the harsh winds of winter blow through the streets of New York City, the homeless singer/songwriter drifts from couch to couch in search of his big break. Feeling that he's finally burned his bridge with longtime friends and fellow folk singers Jim (Justin Timberlake) and Jean (Carey Mulligan), and convinced that his recent work on a novelty song will lead him nowhere, Llewyn hitches a ride to Chicago with the mysterious Roland Turner (John Goodman) and his taciturn valet Johnny Five (Garrett Hedlund) on a mission to audition for famed impresario Bud Grossman (F. Murray Abraham). Meanwhile, Llewyn discovers that he himself may be the biggest obstacle on his arduous road to success. In celebration of this new release by the Coen Brothers we have scheduled a SEVEN FILM COEN BROTHERS SERIES screening at the Original Princess in Jan and Feb every Monday night.